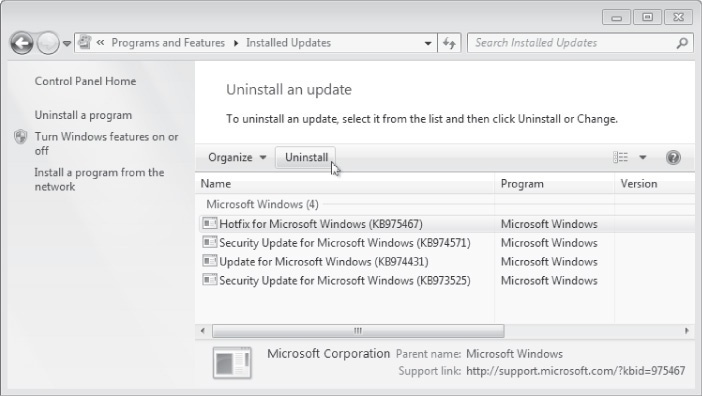 Under Programs, click the Uninstall A Program link. Click the View Installed Updates link. Select the update you want to remove. Then, click Uninstall, as shown in Figure 1. Follow the prompts that appear and restart the computer if required. You can also remove an update using the Wusa.exe tool. If removing the update does not resolve the problem, you should reapply the update. If removing the update does solve the problem, inform the application developer (in the case of a program incompatibility) or your Microsoft support representative of the incompatibility. The update probably fixes a different problem, so you should make every effort to fix the compatibility problem and install the update. In this practice, you configure a client running Windows 7 to download updates from a WSUS server. In this exercise, you check the update level on your computer running Windows 7. If you have not installed any updates on the computer running Windows 7, skip to Exercise 2. Log on to a computer running Windows 7 as an administrator. On the Programs And Features page, click View Installed Updates. Right-click one of the updates and then click Uninstall. Click Yes when prompted. If prompted, restart the computer. Uninstalling this update allows you to reinstall it later using WSUS. Click System And Security and then click Windows Update. Click Check For Updates. At least one update should be available. Click View Available Updates. Because the computer running Windows 7 has the default setting, Windows Update is contacting Microsoft directly to find the latest updates. In this exercise, you install WSUS on a server, approve updates, and then configure a client running Windows 7 to retrieve updates from that server. Log on to a computer running Windows Server 2008 R2 as an administrator. Click the Roles node, and then click Add Roles in the Details pane. The Add Roles Wizard appears. On the Select Server Roles page, select the Windows Server Update Services role. When prompted, add any required role services. Click Next four times, and then click Install. When the Windows Server Update Services Setup Wizard appears (it might be behind the Add Roles Wizard), click Next. When you add the WSUS server role, Windows Server 2008 R2 downloads the latest version directly from Microsoft. As of the time of this writing, the current version of WSUS is WSUS version 3.0 with Service Pack 2. If Microsoft has updated WSUS to a newer version, the steps required to install WSUS will vary. You probably can accept the default settings, but you should choose not to store updates locally. On the License Agreement page, read the license agreement. Then, click I Accept The Terms Of The License Agreement, and click Next. On the Required Components To Use Administration UI page, click Next. On the Select Update Source page, clear the Store Updates Locally check box to prevent the WSUS server from copying updates locally. In a production environment, you would leave this check box selected so that clients could download updates from your WSUS (across your local area network) instead of directly from Microsoft (using your Internet connection). Click Next. If the Connecting To SQL Server Instance page appears, click Next. On the Web Site Selection page, click Next to use the default IIS Web site. In a production environment, you would create a new WSUS Web site if the WSUS server hosted other Web sites. On the Completing The WSUS Setup Wizard page, click Finish. On the Installation Results page, click Close. Restart your computer if prompted. The Windows Server Update Services Configuration Wizard might have opened automatically. If it did not, click Start, click Administrative Tools, and then click Windows Server Update Services. On the Join The Microsoft Update Improvement Program page, click Next. On the Choose Upstream Server page, click Next. On the Specify Proxy Server page, click Next. On the Connect To Upstream Server page, click Start Connecting. Wait while the WSUS Configuration Wizard downloads information from Microsoft Update. When the Next button is available, click it. On the Choose Products page, notice that only Office and Windows updates are downloaded by default. Browse through the other update types that are available so that you become familiar with them, and then accept these default settings by clicking Next. On the Choose Classifications page, select the All Classifications check box. Click Next. On the Set Sync Schedule page, click Next. On the Finish page, click Next. On the What's Next page, make note of other WSUS configuration steps. Click Finish. Because this exam focuses on the client running Windows 7 and not the WSUS server, this exercise does not go through all these configuration steps. However, in a production environment, WSUS would require additional configuration. Next, you need to configure AD DS Group Policy settings so that domain members synchronize with the WSUS server. On the computer running Windows Server 2008 R2, click Start, click Administrative Tools, and then click Group Policy Management. In the Group Policy Management console, select the Group Policy Management\Forest\Domains\nwtraders.msft\Default Domain Policy node. Right-click Default Domain Policy, and then click Edit. In the Group Policy Management Editor, select the Computer Configuration\Policies\Administrative Templates\Windows Components\Windows Update node. Double-click the Specify Intranet Microsoft Update Service Location setting. Click Enabled. In the Set The Intranet Update Service For Detecting updates box, type http:// and the name of your computer running Windows Server 2008 R2 (such as http://DC1). This configures clients to which the Group Policy Object (GPO) is applied to contact the WSUS server instead of Microsoft Update. Click OK. In the Group Policy Management Editor, double-click the Configure Automatic Updates policy. Click Enabled. In the Configure Automatic Updating list, examine the different possible settings. Select 3 – Auto Download And Notify For Install. Accept the default settings by clicking OK.
Double-click the Turn On Recommended Updates Via Automatic Updates policy. Click Enabled. This enables Windows Update to install both recommended updates, which include driver updates and new Windows features, and important updates. Click OK.
Open the Windows Server Update Services console from the Administrative Tools folder on the Start menu. In the Update Services console, if your server does not appear in the Update Services list, click the Connect To Server link in the Actions pane, type the server name, and then click Connect. Select the Update Services\<server_name>\Computers\Synchronizations node. If a synchronization is currently running, select it. Wait until the synchronization completes. Select the Update Services\<server_name>\Updates\All Updates node. In the Approval, select Unapproved. In the Status list, select Failed Or Needed. Then, click Refresh, and wait several minutes for the Update Services console to display the list of unapproved updates. Right-click any updates that appear, and then click Approve. To select all updates, press Ctrl+A. If no updates appear, verify that your computer running Windows 7 appears when you select the Computers\All Computers node. If you still see no updates, verify that the WSUS server has downloaded available updates from Microsoft. If updates have been synchronized, you might need to wait until Windows Update on the client notifies the WSUS server of its current status. 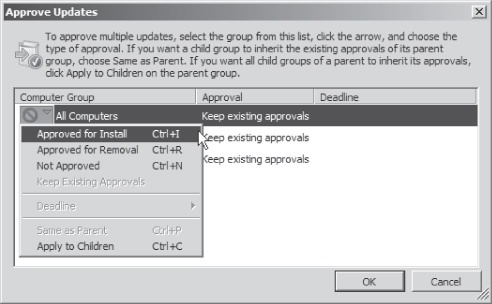 In the Approve Updates dialog box, select the All Computers list and then click Approved For Install, as shown in Figure 2. Then, click OK. If prompted, review the license terms and click I Accept as many times as necessary. In the Approval Progress dialog box, click Close. In this exercise, you check for updates on your client computer running Windows 7. Log on to your computer running Windows 7. Wait a few minutes for Windows 7 to display a notification bubble informing the user of the presence of updates. Click the bubble. In the Windows Update window, click Install Updates. Follow the prompts that appear to complete the update installation, and restart the computer if required. In this exercise, you remove an update from your client computer running Windows 7. In the real world, you might do this if an update caused application compatibility problems. Click one of the updates you installed in Exercise 3. Then, click Uninstall.